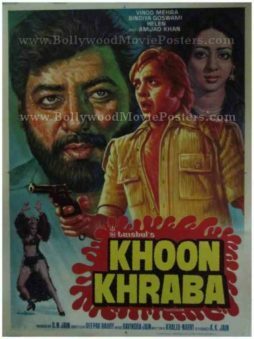 Old Bollywood poster for sale of the classic Hindi film Khoon Ka Badla Phansi (1986). This is an actual surviving vintage Bollywood poster of the 1986 Hindi film that featured Anuradha, Poornima Jayaram and Madhavi in prominent roles. 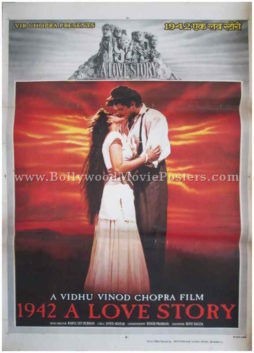 Printed and circulated during the original first release of the film in the mid 1980s, this vintage Bollywood poster for sale was printed for publicity of the film but never ended up being used. 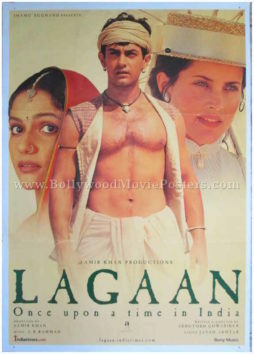 This old Bollywood movie poster was originally hand designed by arranging still photographs from key scenes in the film on a canvas board to create an interesting collage. The pictures of the stars are seen over painted with oil paints using bright colors to highlight the faces in this vintage Bollywood poster. The lead actress is seen holding a pistol in a stunning over painted photograph prominently in this old Bollywood poster for sale. The background is a mix of yellow, green and blue, giving this Bollywood poster a stunning appearance. 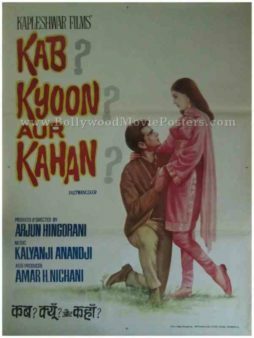 Old Bollywood poster for sale of the vintage Hindi film Kab? Kyoon? Aur Kahan ? (1970). 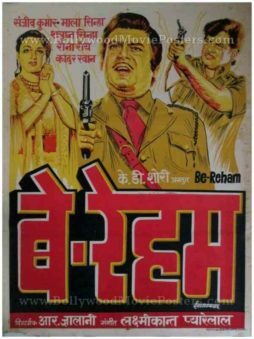 This is an actual surviving vintage Bollywood poster of the 1970 mystery thriller that featured the original He-Man of Bollywood, Dharmendra in the lead role opposite Babita. 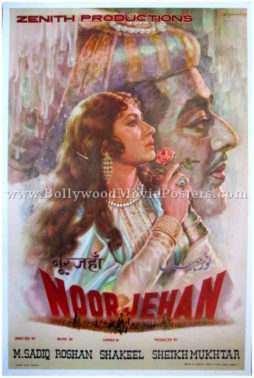 Printed and circulated during the original first release of the film in the late 1960s, this old Bollywood poster for sale was printed for publicity of the film but never ended up being used. This vintage Bollywood poster for sale was originally designed in hand painted oil on canvas format by a leading poster art studio in Bombay. A stunning hand painted portrait of Dharmendra on his knees wooing his lady love Babita is seen in this minimalist Bollywood poster. 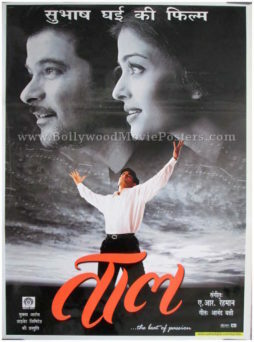 The background is kept blank and the title is seen prominently on the left side of this old Bollywood poster for sale. The question marks appear in dull gray, giving away the mystery element of the film. 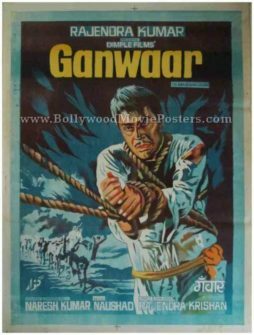 Old Bollywood poster for sale of the classic Hindi film Ganwaar (1970). 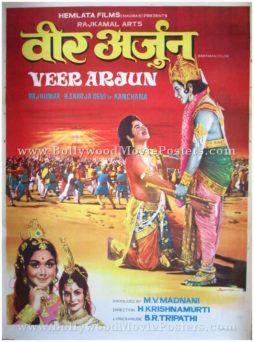 This is an actual surviving vintage Bollywood poster for sale of the 1970 Hindi film that starred Rajendra Kumar, Vyjayanthimala and Pran in prominent roles. 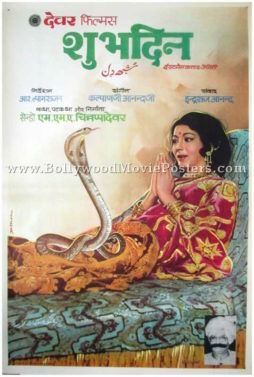 Ganwaar was the last film to feature Vyjayanthimala, making this old Bollywood poster highly collectible! 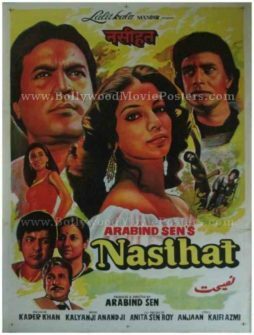 Printed and circulated a few months after the original first release of the film (somewhere in the 1970s), this old Bollywood poster for sale was designed for publicity of the film but never ended up being used. This vintage Bollywood poster was originally hand designed in oil on canvas format. A stunning hand painted portrait of lead actor Rajendra Kumar bound by ropes is seen in this old Bollywood poster. The poster has been set against a blue background with beautiful visible brush strokes. 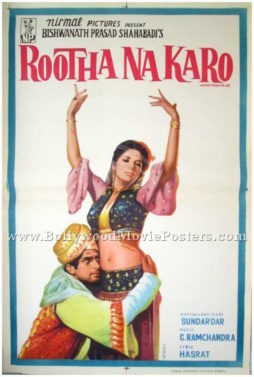 Title of the film appears in sharp typography in yellow on the top of this vintage Bollywood poster.